This is the view of the gate from the High Street. The entrance for the Westgate Museum is to the far left of the gate. Located on the upper floor it is open weekends and unfortunately we didn't get there, but there's always next time. 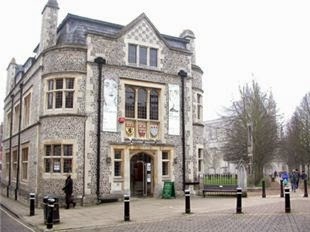 Its sister museum, the City Museum showcases three galleries that do a great job of explaining Winchester's past from the Iron Age to the present. We particularly enjoyed its collection of Roman mosaic floors. They were some of the most complete we've seen. One of our favourite places on High Street is Abbey Gardens. Once the site of St. Mary's Abbey, one of the largest religious houses in England, it was destroyed by Henry VIII. The site was later gifted to the city by Henry's daughter, Queen Mary Tudor in celebration of her marriage to Phillip of Spain which took place in Winchester Cathedral in 1554. Situated along the Itchen River Abbey Gardens is a gathering place for the community. Regardless of the day of the week it's the spot to spend time with friends or family. There's also a children's playground in the far left corner. Almost directly opposite the gardens is a statue of King Alfred the Great. He was a Saxon king who was the first to unite the various tribes and pave the way for a united Britain. He is also the only monarch to be given the title "Great". Standing in the shadow of his statue on High Street provides a spectacular view of St. Giles Hill where since medieval times markets have been held. The views from St. Giles Hill rival those from the top of the Cathedral's tower and it's intoxicating to think this green space has remained a thing of beauty for over 500 years. To reach it we walked along a narrow street called Beggars Lane. Just beyond this lovely cottage is a tiny park. Winchester Cathedral is off in the distance in the middle of the photo. This is looking back at the street (and quaint cottage) from where we'd just come. We continued climbing upward and John could not get over the circumference of this tree. It was huge! The steps and path up to St. Giles Hill made for quite a climb, but it was worth every step. The lookout and park setting made for a lovely, serene walkabout. If you look down at the street in the next photo you'll see the statue of King Alfred. He has his back to us. Partially hidden behind the building with the blue dormer is the Bishop on the Bridge pub. Situated next to the Itchen River it's cozy and inviting interior and delicious pub fare made it one of our favourite haunts. It didn't hurt that it was strategically situated next to the entrance to the river walkway. If John was to spin around and face the other direction he'd come face to face with the staircase below. I admired them the first time we walked past, but assumed it was a private entrance to the building seen in the backgrounds. Thankfully we met a Canadian woman who now calls Winchester home and she explained it was a mini-green space between the walkway and adjoining street. We followed her and are so glad she showed us this little slice of heaven. Returning back to the river walkway, it continues alongside the city wall and past this Roman build waterfall. Opposite it is the city wall where there are lots of benches to sit and enjoy the view. On the opposite side of the wall is another green space reserved for something a little more rigourous. Rugby anyone? At a break in the wall, just a stone's throw from High Street is the entrance to the ruins of Wolvesey Castle seen in this next photo taken from St. Giles Hill. This 12th century castle was built for the Bishop of Winchester, Henry of Blois who was William the Conquerer's grandson. While it is now in ruins the last great function held here was in July 1554 to celebrate the wedding breakfast of Queen Mary Tudor and her husband Phillip of Spain. Next door is the Bishop of Winchester's home and office. Take a look at the two ground level windows on the left. Do you see the downward slope? Apparently it's not just Winchester Cathedral that's suffered from sinking foundations. Continuing our walkabout we spotted the home where Jane Austen spent her final months. She moved to Winchester on the advice of her doctor who would otherwise have to travel 15 miles each way to treat her. After every Winchester walkabout we returned home to care for Poppy. She really enjoyed playing ball with John in the backyard. At other times she'd opt to take it easy and just soak in a few rays. I took these photos of her yesterday just before we bade her a fond farewell as her owners were scheduled to return. We're going to miss this very special Lady of Winchester.